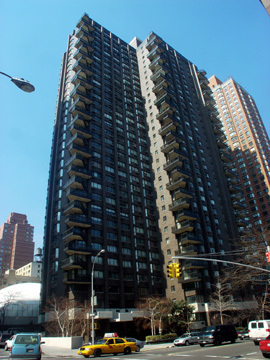 One of the first luxury high-rise towers in the area, Gracie Plaza at 1725 York Avenue is distinguished by its unusual zig-zag pattern of corner balconies that give the building a very aggressive and interesting sculptural form. The balconies overlap but alternate their long sides on different sides of the building so that each one is not overshadowed completely by the one immediate above, an intelligent and surprisingly not often imitated model. 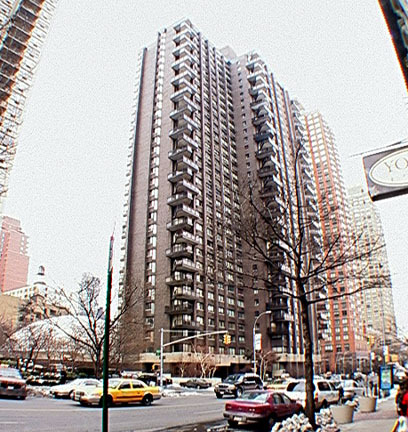 The impressive, 35-story building was also one of the first in the area to have its own driveway and double-height, spacious lobby. Built in 1971, the 256-unit building was converted to a cooperative in 1984. The building has stunning vistas of the Gracie Mansion area, the East River and the many bridges of Long Island Sound. It is also very near the Asphalt Green recreational center and park. 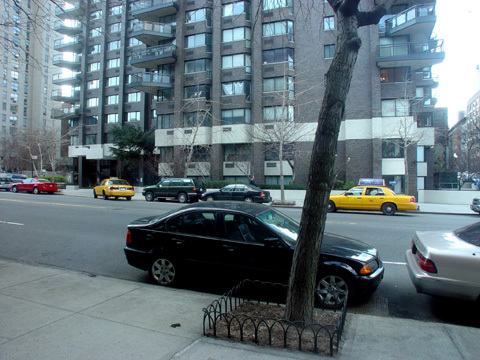 The building, which also has the addresses of 429 East 89th Street and 436 East 90th Street, also has a garage, tennis courts, a doorman, a concierge and a gym. Its strong massing is nicely accented by the two bands of light-colored stone at its base. It was designed by Horace Ginsbern & Associates.